The Rambler™ 10 oz (296 ml). 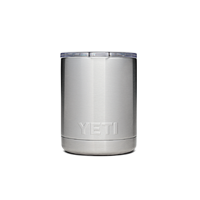 Lowball tumbler is the ideal drinking companion at the deer lease or around the campfire. Whether it replaces your morning coffee cup or serves as your nightly whiskey glass, the Lowball's double-wall vacuum insulation will keep your hot drinks hot and your cold drinks cold far longer than standard drinkware. And unlike your favourite bourbon glass, this Lowball will never shatter or leave a ring on your coffee table, thanks to its 18/8 stainless steel construction and No Sweat™ Design. 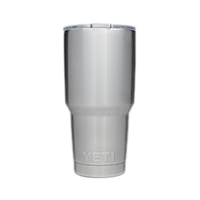 NOTE: Our Rambler 10oz Lowball comes with a standard lid. Our MagSlider lid can be purchased separately.